If you want to tow and haul the heaviest loads, you need a truck that’s up to the task and then some. The 2019 Ram 2500 meets the challenge of whatever you can throw at it, starting with a fully-boxed, high strength steel frame that’s wider than ever before for more stability. In front, a three-link front suspension with disk brakes and eight-lug hubs features front springs that are positioned wider apart, backed up with stronger shocks for a smoother ride, even when loaded to the max. In the rear, Ram 2500’s class-exclusive five-link coil suspension uses cutting edge spring alloy technology to help reduce friction without sacrificing ride quality or towing and hauling capacity. For those who need to tow and haul the heaviest loads, there’s the available rear auto-level suspension, which utilizes a frame-mounted compressor and tank and rear airbag suspension to allow the driver to select from two ride heights at the push of a button, maintaining a level stance even with a tongue-heavy trailer. 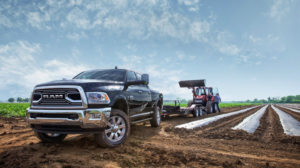 Helping shoulder the load is Ram 2500’s Tow/Haul Mode, which remaps the Ram 2500’s transmission shift patterns and throttle response with a simple button push, letting the motor wind further before shifts, maximizing torque. Speaking of motors: we’re talking Ram Heavy Duty here, so you know there’s some serious grunt under the hood. If you prefer gasoline engines, that means Hemi, and the Ram 2500 comes with your choice of either the 5.7 liter with 383 hp/400 lb.-ft. of torque, or the awesome 6.4 liter Hemi V8, which churns out 410 hp and 429 lb.-ft. of torque. For ultimate towing, there’s the legendary power of the available 6.7-liter high-output Cummins turbo diesel, with 385 horsepower and 900 lb.ft. of earth-rotating torque on tap. When properly equipped, the 2018 Ram 2500 can tow 17,980 pounds, while available features like a factory-installed gooseneck hitch, rear cargo view camera, and power extending tow mirrors make towing and hauling a breeze. There used to be a time when driving a heavy-duty truck with a heavy-duty suspension meant feeling like you’d been kicked in the pants at the end of a long day of driving. The 2018 Ram 2500 puts those days behind you with one of the most comfortable interiors of any heavy truck, from the all-business Tradesman model with gator-tough work grade vinyl seats, all the way up to the ultimate luxury of the Ram 2500 Limited Tungsten Edition, with available heated leather seats with power adjustability. In any trim level, the Ram 2500 offers comfort you might not have thought possible from a truck that can tow and haul so much. Meanwhile, the available Uconnect 8.4-inch touchscreen, the largest color touchscreen available in a pickup of any class, transforms your Ram into a fully-capable office on wheels, with Sirius XM satellite HD radio, 4G LTE connectivity, and smartphone connectivity by Apple CarPlay or Android Auto. Knowing that going to work means bringing along everything from tools to blueprints to laptop computers, the 2018 Ram 2500 has clever storage everywhere, including a cavernous center console, and lidded storage bins built right into the floor. Every stitch and surface says that this is a truck that’s built to last, a statement Ram backs up with a 5-year/100,000 mile diesel powertrain warranty, a 5-year/60,000 mile gasoline powertrain limited warranty, and a 3-year/36,000 mile bumper-to-bumper warranty on all models, even the 2500. If you’ve got loads to tow or haul, and you’re in the market for a heavy-duty truck that works as hard as you do, the 2018 Ram 2500 is the truck for you. With trim and option packages to suit any taste, and the toughness and torque to tow almost any load you want to hitch on behind it, the 2018 Ram 2500 truck is a game-changer for your business, farm or RV towing needs. 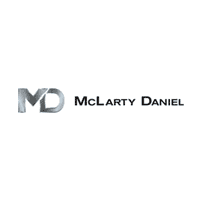 If you’re looking for a 2018 Ram 2500 for sale in Springdale, look no further than McLarty Daniel CDJRF in Springdale. With unbeatable deals and a huge selection of tough, strong, capable, comfortable 2018 Ram 2500 heavy duty trucks, we’ve got the one that’s right for you, and if we don’t, we’ll find it. Come on down and see us for a test drive today, or shop our big selection of 2018 Ram 2500 trucks online, to see why this is the truck you need, the truck you should want, and the truck you deserve.